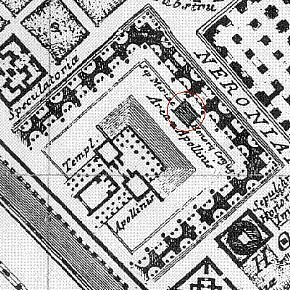 Templum Apollinis as delineated within the first state of the Ichnographia Campus Martius. The Sepulchrum Mariae Honorij Congiig., the tomb of Empress Maria the first wife of Honorius, is the second to last building of ancient Rome designated within the Ichnographia Campus Martius. Piranesi mistakenly represents the tomb of Maria as separate from the tomb of Honorius; Maria's death may well have been the reason Honorius erected his family mausoleum around 400. 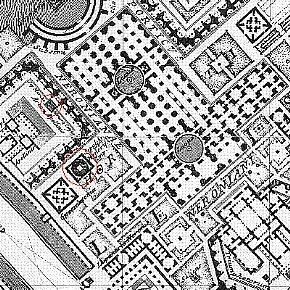 Despite Piranesi's incorrectness, the position of Maria's tomb on the large plan falls within the area of the Vatican Hill that is actually occupied by St. Peter's Basilica, thus adding some veracity to the sepulcher's location. Moreover, Maria's tomb is within a courtyard surrounded on three sides by what appear to be other sepulchers whose placement within the Ichnographia partially coincides with the necropolis still in existence under St. Peter's Basilica, which is the traditionally held burial place of St. Peter himself. Another interesting detail is Piranesi's placement of Maria's tomb directly in front of the Templum Apollonis that is attached to the Circus of Caligula and Nero. According to "The Life of Sylvester" within the Liber Pontificalis, the original St. Peter's Basilica was built "in the shrine of Apollo," thus indicating that Piranesi's placement of the sepulcher of Maria within the Ichnographia was not altogether incorrect, but rather subtly and cleverly making note of the ancient Rome's pagan to Christian inversion. 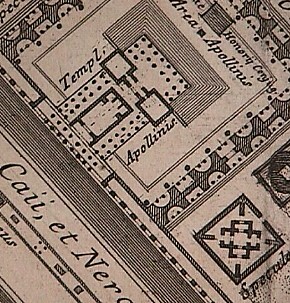 Maria, wife of the emperor Honorius, appears a second time within Piranesi's Il Campo Marzio in the "Ichnographia Campi Martii", the large fold-out plan where Piranesi reenacts ancient Rome's Campo Marzio and its environs, although in this instance, it is the sepulcher of Maria that is delineated rather than her sarcophagus. The sepulcher of Maria sits in front of the Templum Apollinis, and together these structures are within a court enclosed by rows of unnamed sepulchers and adjacent to the Circus of Caligula and Nero. This ensemble is part of the greater Garden of Nero, which is, and indeed was, situated within Rome's Vatican valley. It should be noted, however, that Piranesi separates the sepulcher of Maria from the sepulcher of the Emperor Honorius, the location where Maria's sarcophagus actually did lie. Moreover, neither the sepulcher of Maria nor that of Honorius are placed next to the Basilica of St. Peter's, which is altogether absent from the Ichnographia. Essentially, Piranesi positions two of imperial Rome's Christian remains within an otherwise completely Pagan milieu, thus marking, albeit covertly, precisely where ancient Rome's inversion from Paganism to Christianity most resolutely occurred. Remember, St. Peter was martyred in the Circus of Caligula and Nero and the altar of St. Peter's Basilica marks St. Peter's tomb.